COLLEGE STATION, Texas — The No. 12 Texas A&M Aggies dropped a 7-0 contest to the No. 19 Auburn Tigers Saturday afternoon on Olsen Field at Blue Bell Park. The loss evened the series with the rubber match slated for Sunday at 1:02 p.m. 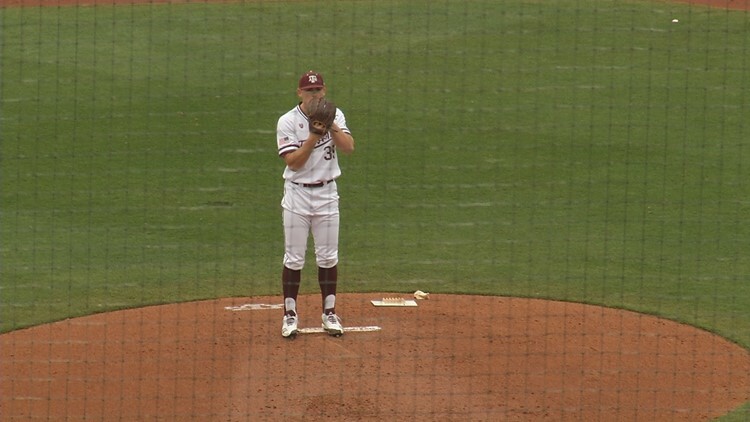 The Aggies were unable to conjure up the big hit with runners in scoring position as the Maroon & White suffered their first shutout of the season. Texas A&M was 2-for-8 with runners in scoring position, but one of the hits was a rocket that got to the rightfielder too quickly for the runner to contemplate scoring from second and the other hit resulted in an Aggie being tagged out at the plate on a perfect through by leftfielder Judd Ward. Asa Lacy (6-1) was saddled with his first loss of the season. He labored through a three-run first inning, but rebounded to work 4.2 innings, yielding three runs on seven hits and one walk while striking out four. Lacy had a 19.1-inning scoreless string snapped with a wild pitch. Chandler Jozwiak retired the first 10 batters he faced out of the bullpen before getting roughed up in the ninth. He ended the day allowing four runs on three hits and one walk while striking out four in 4.0 innings. Mikey Hoehner batted 2-for-3 with one walk as the Aggies’ top hitter. Texas A&M dropped to 26-10-1 on the year, including 8-5-1 in league action. Auburn improved to 24-11 overall and 8-6 in SEC play.